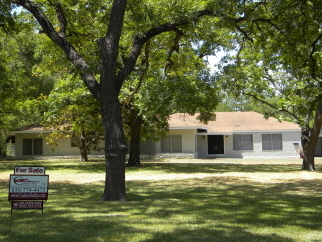 LOTS OF PROPERTY & HOUSE IN THE HEART OF SOUTH DEL RIO! Large Ranch Style Home sits on approx. 2 acres of land w/plenty of trees (Pecan, Magnolia,Palm). Interior & Exterior recently painted. LARGE KITCHEN. Every Bedroom has it's own Bathroom! Too much to list. Must See! Owner is a TX Lic. RE Broker. Prof. Home Inspection & WDI Report to be provided w/Seller's Disclosure. Interior Features ROOMS: Living/Dining Combo, Breakfast Room, Utility Room, Split Bedroom Plan, Bonus Room. FIREPLACES: Masonry, Family Room/Den. MISC. INTERIOR: Ceiling Fans, Wired for Cable, Wired for Surround Sound, W/D Electric. APPLIANCES: Dishwasher, Disposal, Microwave, Range-Electric, Refrigerator. WATER HEATER: Electric. HEATING: Central, Electric. AIR CONDITIONING: Central, Window Unit, Electric. FLOORS: Carpet, Wood, Tile, Terrazzo, Concrete, Ceramic. Exterior Features LEVELS: One Story. EXTERIOR: Stucco. FOUNDATION: Slab, Pier/Beam. ROOF: Composition Shingle. WATER: City Water. SEWER: City Sewer. FENCE: Wood-Privacy, Chain Link, Pipe/Cable. MISC. EXTERIOR: Patio, Covered Patio, Other Building, Satellite Dish, RV/Boat Parking, TENNIS/BASKETBALL COURT, Separate Fenced Area in Backyard w/Metal Shed. Additional Features and Amenities Canal System Irrigation Available. Public Elementary School: Garfield Elementary. Near Sacred Heart Catholic & St. James Episcopal Schools. City of Del Rio maintains a drainage easement at back of property.